Based on a true story, Hoffman is cast in the title role as the high ranking executive in charge of loans for a Toronto bank. Mahowny also has a gambling addiction, and is indebted to his bookie (Maury Chakin) for slightly over ten grand. To cover his marker, Mahowny creates a fictional loan account, and draws cash from it. Going a step further, he approves cash loans to an existing but unsuspecting customer with a large credit limit, and takes the money on weekend trips to Atlantic City, where he consistently loses at dice, cards, and roulette. By the time he's found out, Mahowny has embezzled over $10 million. The film makers made no attempt whatsoever to deliver Mahowny as an attractive person to the audience, and it's a wonder he even has a fiancee, Lisa (Minnie Driver). 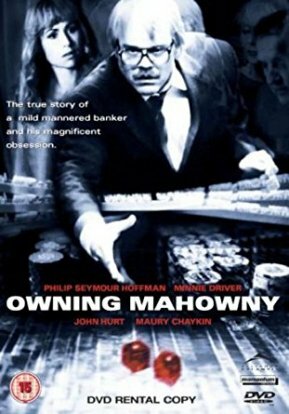 Indeed, Mahowny is so focused on gambling that when the casino manager, Mr. Foss (John Hurt), sends to his suite a complimentary call girl, who sheds her fur coat to reveal all, Mahowny only tells her "You've made a mistake." And he really means it. He only courts Lady Luck. Our hero is so indifferent to anything other than playing the odds that he isn't even somebody with whom you'd consider having a friendly beer. As a true story you know in the end he is going to get caught. He is going to be arrested at some point but you do wonder why long suffering girlfriend Minnie Driver sticks with him because there is little other than obsession in his character. Films about the sickness of obsessive gambling are few and far between, even rarer ones that made it so real that you can't watch the whole movie in one sitting. This is one of those. The daddy of them all is still The Gambler (1974) with James Caan. The difference is Caan plays a complete character which you can engage with and feel empathy for. Not sure anyone can feel anything for the Mahowny in this movie. Nevertheless a great portrayal. On a small budget great attention was made to make scenes look like early 1980s and with great effect. Strangely they didn't think too much about the inside of the casino. The first shot of a roulette wheel is of a John Huxley Starburst wheel, first made in the year 2000 (but then only I would know that - Ed.). Definitely Gambling film noir though.